There’s a lot to think about during kitchen remodeling but the difference between a great or just okay outcome is in the details, according to designer and Houzz contributor, Barbra Bright. The designers at KBC Remodeling Services in Longmont focus on the big picture and small details to create a stunning kitchen remodel. Hide the microwave: While it is used frequently, it isn’t the most appealing device and can take up valuable counter space so tucking the microwave in a cabinet makes sense. Blend in the dishwasher: If you would like a seamless appearance with the lower cabinetry, have a matching panel installed on the dishwasher front. Give the hood space: A chimney-style hood should be installed 2-3” away from the wall cabinets, and rethink putting glass-fronted cabinets there unless you don’t mind frequent cleaning. 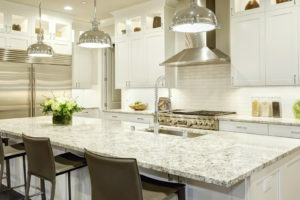 Install task lighting: The proper area to install undercabinet lighting is towards the front in order to illuminate the counter, not the backsplash. Light glass-fronted cabinets: If you’ve chosen a glass front for a cabinet, you want the contents to be on display so why not install LED strips to highlight your dishes at night too? Position the island sink off-center: To maximize prep space on an island, consider installing the sink towards one end instead of in the center. Design drawer interiors to stay organized: One example of cumbersome kitchen gear are pot lids but creating a divider in a pullout drawer keeps them stored neatly. Minimize countertop clutter: Consider installing accessories like a soap dispenser to keep your countertops clean. Coordinate the outlets: Outlets are required every 4 feet in a kitchen but they don’t need to be glaring eyesores! Match them to the color of your backsplash and install them closer to the counter horizontally so they don’t detract from the beautiful tile. Or conceal them: Two ways to avoid outlets in the backsplash are installing undercabinet plug molding or pop-up outlets in the counter! If you’re ready to take a break from turning on the oven this summer, contact the experts at KBC Remodeling Services in Longmont for functional and beautiful kitchen remodeling service!